In dry heat, cold could be made by three ingenious constructions, of which usually at least two were combined. Yakhchāls (ice pits), āb anbārs (water reservoirs) and bâdgir (windcatchers) were used to lower the indoor temperature of buildings (such as air conditioning, cooling, for icing, etc.) to cool perishable nutrition all year round on a passive basis and store it, and even make ice cream desserts (faloodeh). Yakhchāls were already an existing and well-controlled technology in the Iranian (Persian) world around ~ 400 BC, and they are still there! The constructions obviously had very thick walls (at the base up to 2 meters). They were built with saooj: heat-resistant and waterproof mortar made from clay, sand, proteins, lime, ash and goat hair (regionally in certain quantities and processed in a specific way). Large evaporative coolers are based on the use of underground humid cold storage rooms (Āb Anbārs, up to 5,000 m²! ), A large above-ground dome with thick walls and wind deflectors to move air. The wind catchers draw cool air through well insulated towers to ventilation openings. The qanats (underground canals or aqueducts) are often fed by melting snow from the mountains. High walling can be used to provide shade. Sometimes the underground parts are only filled with ice during the winter months by freezing water from the qanāts. In other (desert) regions with large temperature differences, this is possible even in a day and night rhythm. Wind Catchers (Bâdgirs) usually stand by 4 or 8 (sometimes only 1) around or against a construction to increase ventilation, lower the inside temperature and provide cooling by evaporation. 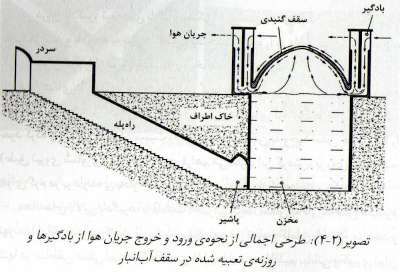 There are different designs: with downward flow (a), with upward draft (b) (often in combination with qanāts supply), and as a solar chimney (c). A tower (a) with opening(s) on one side captures every breath of the (predominant) wind that is led downwards. Often, courtyards are used to confine cool night air. Wind deflectors (b) opposite the direction of the prevailing winds in combination with cool air inlet at or below ground level often have movable openings or adjustable towers, to direct them away from the wind. The solar chimney (c) is an easy way to drain hot air and hold colder night air. Next to my house there is a very narrow walled alley with almost no sun. With mosquito netting in front of the window, it is now a very suitable place to get cool air. I could improve the effect by hanging wet mesh. It can be that simple. You feel the difference yourself when you are in the sun or in the shade. Ancient Egyptian air conditioning technology with "evaporative cooling" cools the air in a building with max. 25 degrees C by running water over terracotta cones in a dry environment. The clay pipes are stacked on top of each other in an outer wall (large opening inwards / outwards) in honeycomb form. They are moistened by seeping water at least once or twice a day. The porous cones absorb water that seeps over the outside surface, where it evaporates and thus cools down.